When you want to protect your car completely from effect of harsh winter, the winter windscreen cover is the best option. There are different types of windscreen covers in the market today designed mainly for cars. Among other ones, Lanmodo car cover is the best in the market. Your car will be completely protected when you make use of the windscreen cover recommended in this winter. This is a technologically improved winter car windscreen cover that can give you all the things you need. This is built using waterproofed cloth and magnetic edges. The quality material used in the design and decoration of this car cover is among the things that made it the best. That is why most people are going for this great car cover. Even as this car cover is well built, it still has some defects. The major defect associated with this is that it is manually operated. But, if what you are looking for is the windscreen built with automatic operating design the Lanmodo is the brand you need. This is designed with double lashes ensuring durability to user. The Hopkins is among the trending brands in the industry. Also, if what you are looking for is the car cover that will not give you trouble to install, this is among the options. This is also comes with mirror lashes where the robe can easily be attached. That means your mirror will equally be covered when you make use of this car cover. Another thing about this improved car cover is that it is built to cover not just small cars but also bigger cars. This car cover equally has some defects that made it not fitting for most people. The major defect is that it is built with cloth that is hard to wash and clean. If what you want is the winter snow car windshield cover with all these features plus, you should go for Lanmodo. This is built with best quality and easy to clean canopy. 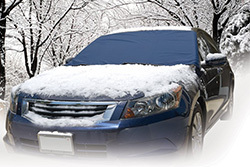 If what you have always been looking for is the best winter windscreen cover for your car, Lanmodo is the name. This is the technologically improved modern car umbrella designed with met the needs of all users. Another thing about Lanmodo is that it is built with all the features needed to make users enjoy convenience. The first thing about this car cover is that it is operated automatically. The setup or installation is done within few seconds. 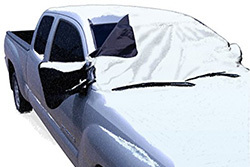 That simply means you will not need to waste your precious time trying to handle a difficult installation process of most car windshield covers in the market. The process of installation is also explained plainly for users on the manual of this windshield car cover. So, you do not even need any professional direction or guide to get your car cover completed. Just check out the manuals and you will get what you need. When you make use of the Lanmodo car cover, you will be sure of absolute protection on your car from hail, snow, bird dropping, rain and others. With the customizable feature of the car canopy, you can even make use of it for your brand marketing. This is built folding functionality with the use of the remote control, which makes it portable to take along. This is made with Oxford quality material that is easy to wash and clean at any time. Installation is easy and extremely simple. It only takes few clicks on a remote button. With the multifunction feature of Lanmodo car cover, you can make use of it for your outdoor recreational activities including beach party and camping.